Another Toastmasters year has begun on July 1. 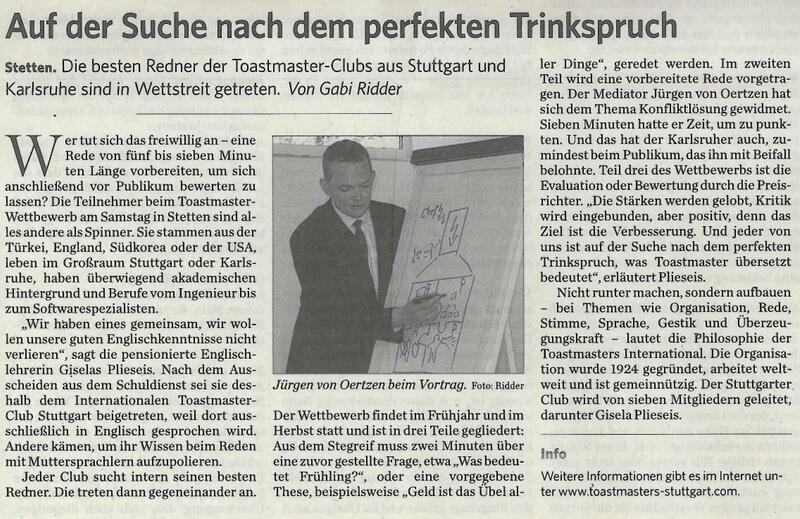 The Stuttgart International Toastmasters Club has entered the 41st year of its storied existence. This fall there will be a speech contest for Humorous Speech and Table Topics. There are several levels for this contest. The first part will take place at the club level and will be held on September 16th at our normal meeting location and time. It will be followed by the Division F contest which has been announced for October 30th. Finally the District 59 contest will be held November 19-21 in Barcelona. Take this chance to build up your courage and step a little bit out of your comfort zone and participate in either or both contests! First of all, it was a very enjoyable, educational, and inspiring conference. As luck would have it, the weather completely cooperated with us, which made it even all that much more fun as the conference hotel was located directly on the beach! The speeches in the International Speech Contest and the evaluations in the Evaluation Contest were all superb. Our own Amy Hamilton competed in the Evaluation Contest. She of course did very well but unfortunately did not place. It is still a noteworthy accomplishment to be competing at that level. The educational sessions that I attended were very well done. It is always good to get some input and guidance from other accomplished Toastmasters. The business portion of the conference was pretty routine. It was noted that District 59 is ranked number 7 in the world, which is quite an accomplishment. They also have hopes of getting to number 6, which would make the District as President´s Distinguished. The other thing I would like to pass along is the results of the District Officer elections as I think it is important for you to know who is representing you in the Toastmaster organization. The Area Governor will be appointed at a later date. The next District 59 Fall Conference will be in Barcelona, Spain on November 19-21. Next year´s District 59 Spring Conference will be in Lisbon, Portugal on May 20-22. If you have an opportunity to attend any of these conferences, I would highly encourage you to do so. Important meeting dates – Start time changes ! The June meetings will take place on June 17th (normal third Thursday meeting) and June 24th (out of sequence meeting on the fourth Thursday). This is due to the holiday on June 3rd. EFFECTIVE JULY 1, THE MEETINGS WILL START AT 19:30. From the recent survey and from other comments and communication, it was clear that an earlier start time for the meeting was desired. Of course, it is also understood that this new start time might not be the best for everyone. But the officers decided to try out moving the start time up 30 minutes. Let´s see how it goes. Please note that the meeting on May 20th as well as the meetings in June will start at 20:00. Division F contest: Success for Stuttgart International Toastmasters ! Amy, Gisela, Joachim, Monique and Kelly had the privilege of attending the Division F International Speech and Evaluation contests in Wiesbaden yesterday. It was a very full but enjoyable day. There were seven speeches in each of the English and German International Speech contests as well as six contestants in the English Evaluation contest and four contestants in the German Evaluation contest. It was fun, interesting, and educational to see so many great speeches! It was also very nice to get to interact with so many other Toastmasters from different clubs. Amy will now represent Division F for the English Evaluation Contest at District 59 Conference in The Hague in June. Of course we all know that she has a very good chance of winning there, and we wish here much success. Kelly will also be attending the conference in The Hague, and there is still time to register if you would also like to go. It would be well worth the trip. Here are the videos of the participants from the Stuttgart International Toastmasters Club. After the interview of Olivier, we have interviewed Gisela, one of the most senior members of our club and holding the officer role of treasurer. Stuttgart International Toastmasters Club: Could you introduce yourself to our readers? Gisela: I was born into a middle-class family in Passau where my father worked as a lawyer. After leaving grammar school I found a job as an au pair girl in London. That was the time when I discovered my love for the English language. After taking my degree in English and Geography I taught those subjects at various grammar schools in Bonn and in Böblingen for 35 years. I loved my job, although teaching unruly children can be very straining being the head of the language department was not much easier either. When in the year 2000 I was sent into retirement that I had more spare time.That is why I looked for an opportunity to speak English and found it with Toastmasters. SITC: Who told you about Toastmasters? Gisela: A former colleague told me about Toastmasters. I accompanied her to a meeting and liked it. SITC: What do you like best at Toastmasters? Gisela: I like the mix of people best in our club, its international character and the fact that people from all walks of life meet there. SITC: What were your expectations when you joined the club? Gisela: All my life I had had problems to overcome my nervousness when speaking in public. This was my chance to learn how to overcome it. SITC: Have you made progress? In which field? Gisela: Yes, I have made progress. I am still not completely relaxed whenever I speak in public, but I am much less nervous now. In the field of leadership there was not so much need for improvement because I had practised those skills daily at school. SITC: Do you have an example of a situation in your personal or professional life when your Toastmaster skills were helpful? Gisela: Time and again I can use my toastmaster approach of expressing my thoughts from a positive point of view e.g. telling my private students what they have done well or negotiating over money with the IBMKlub treasurer. SITC: What do you think is required to become a successful Toastmaster? Gisela: Becoming a successful Toastmaster requires a lot of practice. I think that also attending the meetings regularly and taking over roles is of great importance. SITC: Which officer roles have you held so far? Gisela: I started as Sergeant of Arms, continued as VPEducation for several years and was President twice. SITC: Which role did you like best? Gisela: I liked the role of VPEducation best because I like organising and I want to make sure that our club is successful for the good of all of us. SITC: What would you tell a person reading this article hesitating to come to a meeting? Gisela: I would tell that person to come and see what our meetings are like. Furthermore I would explain how much more I could have profited in my work if I had heard of Toasters earlier. Thank you Gisela for this wonderful interview ! Please note that I have been informed that a Demonstration will take place around the main train station on that day. Please contact the officers, carpooling will be organized. We are looking forward to seeing you there ! The Clarion is the newsletter of the District 59 Toastmasters. Enjoy the last edition !